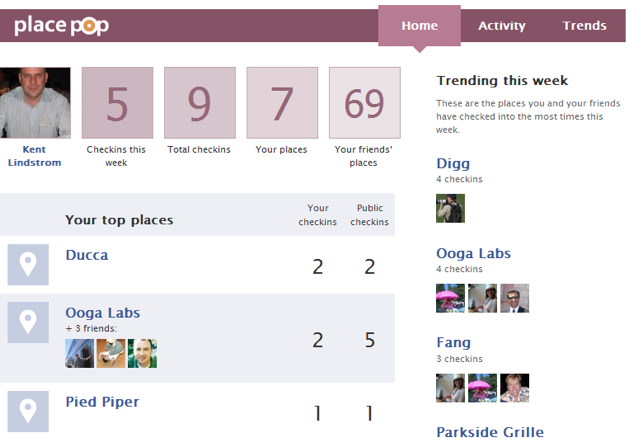 Facebook Places appears to be off to a strong start, with integration into services like Gowalla, Yelp, and SCVNGR. But it also has some pretty glaring omissions, namely the fact there’s not really a good way to do much with Places data from the browser. Now PlacePop, a startup that launched at our CrunchUp in July, has fixed that with a new Facebook application that gives you an overview of how you friends are using Facebook Places. You can access the new application right here. The new application can best be described as a power user’s tool for Facebook Places. After connecting it with your account, you’ll see a dashboard offering an overview of your recent Places activity: data like your total checkins this week, the venues you check into most frequently, and how often your friends are checking in. There’s also a handy ‘Trending’ category that shows you where your friends have been checking into the most. The application’s second tab is an ‘Activity’ section, which displays a feed of all of your friends’ recent checkins — in other words, an at-a-glance view of where everyone is right now, similar to what you’ll get from Facebook’s mobile application. The third tab is for Trends, featuring graphs tracking which venues are most popular over time. The application is easy to use and has a clean design — it’s definitely worth checking out if you’d like to explore Facebook Places. That said, we can also probably expect Facebook to build out much of this functionality itself in the not-so-distant future.